University student Shiori Suzuki visited Myanmar in 2013 as a tourist. What she did not notice there was the plight of the Muslim minority Rohingya — and only learned about them and their situation from a newspaper article upon her return. “What did I see in Myanmar?” the 22-year-old Keio University student recalls asking herself after reading the news piece about the persecution of Rohingya and the human trafficking they undergo to seek better conditions in other countries. Suzuki decided to do something. 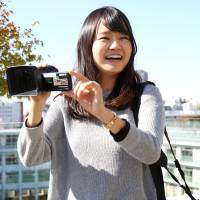 She bought a secondhand video camera and began chronicling the lives of members of the ethnic group who have sought refuge in Japan. She and her friends started making frequent visits to a community of Rohingya refugees in Tatebayashi, Gunma Prefecture. Over the course of about 18 months they followed the lives of 50 out of some 200 residents there. Suzuki made a 20-minute film, titled “Hikari” (Light), which focuses on everyday life for the migrants in Japan rather than what they have left behind. She filmed children playing together as their fathers look on smiling. “We want the audience to know the true face of those labeled ‘refugees’ in Japan,” she said. Typical scenes include activity in a kitchen at the home of a refugee family and at a school athletic field. Suzuki made the film as part of her activities with S.A.L. (Send Out, Aid, Learn), a student group that aims to deepen understanding and raise public awareness about international issues. The film was completed in fall 2014. It began attracting attention and has been screened at a youth event hosted by the Office of the U.N. High Commissioner for Refugees. Suzuki said she is willing to screen the film at other events upon request. One of the Rohingya she documented said he had been tortured and showed her his scars. He has failed to obtain a work visa in Japan and remains unemployed. Suzuki expresses frustration at being unable to do anything to help the Rohingya migrants. The student hopes her film will help viewers in Japan feel close to the Rohingya living in the country.